We live in a time crunched society today. It is indeed hard to find the time to make jewelry. However, there is a wonderful series of jewelry making books published by Lark Crafts which addresses this deficit. The projects can be made very quickly. The 60 designs from 30-Minute Rings showcase highly creative pieces by some of today's top innovative artisans. The rings are guaranteed to draw attention to one's fingers! I agree with the juror, Marthe Le Van who said, "Your hands are among the most expressive parts of your body. They communicate joy and frustration, anxiety and experience, and love and hope with incredible fluency." The book inspires readers to try new techniques, combine them and use unusual materials. 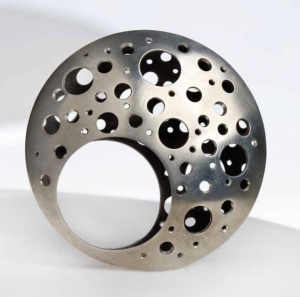 One such ring is the one made by Karen Rakoski. She sanded, carved, sawed and scratched the ring from plastic plumbing pipe. A dust mask or respirator should be used when working with this kind of material. As you can see from the free tutorial for this ring, the instructions do not include the typical step by step photography used in other books. Many of the projects require some experience with metal work techniques such as sawing and soldering in order to make the rings in the allotted time span. It is worth the effort to learn and practice as you can make some really pretty rings. One of my favorites is Victoria Tillotson's beaded ring. You can check out the tutorial here. Kenneth C. McBain's ring really does have a space age look about it. See how he accomplished the design in the PDF tutorial. 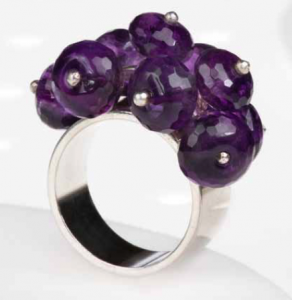 2 Roses Studio's ring also has a modern yet funky look! 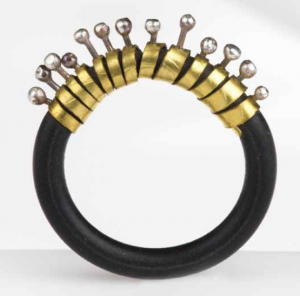 The main part of the ring is black buna cord which is a type of synthetic rubber. The tutorial explains how to hide the cord ends within the brass spiral element. I have a spare copy of this book so one lucky winner will be receiving it in the mail! If you wish to try your luck please make a comment below. Make sure you leave contact info if you do not have an online shop or blog. It ends in a week's time at 6 pm EST Monday, August 20, 2012. I will pick a winner randomly and announce the results as soon as possible after. So be sure to leave a contact email if you don't have an online link or make sure you come back and check! Otherwise I will redraw in a week. Good luck! Looks like a great book. If you use ring blanks, you might be able to make the them in less than 30 minutes. Looks like a fantastic book! I would certainly make some of the rings shown. That is an excellent alternative! Hi Pearl I would love to win this book. You give me some of my best ideas and this book would really help me have something more to offer when I do jewellery shows. I look forward to your daily emails and I open them first everyday. What a great giveaway! I LOVE rings---so fun and easy to change up your look to fit your mood! I would love to win this book. Thanks for all the free tutorials. Your great! Ohh this looks like so much fun to learn. I am a begginer making jewlery. I love the PVC Ring I can't wait to try it. Thanks for making a copy of the book as a giveaway. Love all of your projects!! Would love to win this book!! Looks like this book will be a great inspiration! Thanks for the opportunity! This book looks VERY interesting. Love rings!!!! Would love to win your book!! Appreciate all of your totorials! I am so glad that I found your blog! I have learned so much from you and your blog entries. The links you provide are wonderful. This book would look great on my shelf! Thanks, Pearl! clothes, so that I can go crazy with accessories. They're my thing. Love this book already. I have been wanting this book for a while! Would love to win it! I love the pvc ring, what a great idea. I LOVE your blog, wish i was into jewellry making when I lived in Halifax. This looks like a fun book and I would love to win a copy! Its Donna your #1 FAN and I'd LOVE to win this book, there looks to be some FUN rings in this series that I'd LOVE to try!!! What a wonderful book! I'd love to own a copy. Thanks for sharing!! The rings look cool. Can't wait to try the tutorials. I would love to have it!! I'm a follower on FB, Twitter, Blog.....Please add me to your growing list. I still love all your interesting article!!! Beautiful, and interesting, book. Thanks for a chance at winning! Pick me, pick me. I never win anything. But thats ok. I still greatly enjoy reading your journal. I am a regular subscriber. Oh I would so love to win this book, it looks super! Wow! Such a fabulous book! And I have so much collected "stuff" to make rings out of - I didn't realized they could be turned into rings until now! Thank you so much for sharing this. If I don't win the book I will certainly be putting it on my Wish List. Ooh, I've been wanting to make rings, this could be a great starting point! I've been wanting to start making rings, this could be just the ticket! I'm a FB subscriber, subscribe on 2 Twitter accounts, and am an email subscriber. I'd love a chance to win this book. I've tried rings once or twice and wasn't happy with them, so this book would be great. Wow, this looks fantastic. I would absolutely love to win this book and try out one of the tutorials. Thanks for offering the great opportunity to expand our jewelry-making horizons! Looks like a very inspirational book! I would love a chance to win. I love rings and haven't made any in quite some time. It would be great to get a copy of this book on making rings in 30 minutes. I love this book. Please count me in. I'm blog follower and I have US address thought I'm currently not there. Thank you. Hi Pearl! I would love to improve my ring skills, so this book would be of great use to me! I'm so glad I was able to catch up on my reading and get the chance to enter before it was too late. This looks like a great book to inspire.